Skimmers for Chinese Restaurants and restaurant kitchens. These chinese restaurant Skimmers are strong and durable for busy kitchen. Vollrath Stainless Steel Heavy Duty Skimmer Blade - 6 in. Tablecraft Round Square Mesh Skimmer - 6 in. 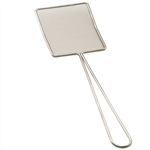 Tablecraft Stainless Steel Rectangle Fine Mesh Skimmer - 5 in. x 6.5 in. Update International Stainless Steel Round Wire Skimmers - 5.5 in. Round Bowl Wire Skimmers - 7 in. Buy your chinese restaurant Skimmers from the leader in chinese restaurant supply.